Visit the Vegan Society of PEACE outreach table at the Houston Peace Festival on March 6th! Be sure to attend our 2010 MEATOUT Event on March 20th! Join us for free vegan food samples and fun for all ages! Join members of the Houston Health Association/Natural Hygiene Network for their monthly meeting. This month, they will be meeting at A Moveable Feast Cafe in Houston, where there are a variety of vegan options available on the menu. There will be a short presentation on vegan health & nutrition following the meal. The event begins at 6:30 PM. Society of PEACE member Dr. Mamiko Matsuda is the organizer of this group. Please visit Houston Health Association to learn more, or call Mamiko at 713-622-6051. The Vegan Society of PEACE will have an outreach table at the Houston 2010 Peace Festival on Saturday, March 6th. The festival will be a day of celebration with local and national organizations working to improve our community! There will be live music, dance performances, artists, vendors and peace-promoting nonprofit organizations. Join the Houston Vegan Meetup for their social Dinner on Saturday, March 6 at 5:30 PM. This month, the group will be meeting again at Field of Greens Restaurant in Houston, where there are a variety of vegetarian & vegan options available on the menu. The event begins promptly at 5:30 PM. Please RSVP online with the Houston Vegan Meetup. The Houston Vegan Meetup is organized by Society of PEACE member Reese Blair. Raw Vegan Class: "Save the Planet: Eat your Veggies RAW"
Leisure Learning Unlimited presents "Save the Planet: Eat your Veggies RAW", featuring raw vegan chef & KPFT radio personality Pat Greer. The raw vegan class is on Sunday, March 7, 2010 from 1:00 - 4:00 PM in Memorial Park (I-10/Washington) in Houston. This class will focus on Preparation and Dehydration. Recipes include Coconut Kookies, Apple Spice Kookies, breads, corn chips and krackers. All are easy and tasty. This class will demonstrate using an Excalibur Dehydrator. Recipes will be provided. The cost of the class is $55 and includes the food sampling. For more information and to register, CLICK HERE. Participants must register in advance through Leisure Learning, as class size is limited! Join the Houston Raw Vegan Enthusiasts for their raw vegan potluck dinner at Taft Street Coffee House. Please bring a raw vegan dish to share with the group. Note: newcomers need not bring a dish the first time -- just come and enjoy. The event begins promptly at 6:30 PM at the Taft Street Coffee House in Houston. The Raw Vegan Enthusiasts group meets twice monthly - on the 2nd Wednesday & 4th Thursday of every month. For more information on the group, call the Taft Street Coffee House at 712-522-3533. Join members of the Houston Vegetarian Meetup for their next social Dinner. The group will be gathering on Saturday, March 13, 2010 at Loving Hut Restaurant in Houston. This restaurant is 100% vegan and features the cuisine of Asia, India and a few American favorites, as well as vegan cake! The event begins promptly at 5:30 PM and seating is limited. Please RSVP online at the Houston Vegetarian Meetup. The Houston Vegetarian Meetup is organized by Society of PEACE members Michelle, Mari, Robert & Lisamarie. Vegan Cooking Class: "Farm to Table: Making Vegan Food Delicious"
Leisure Learning Unlimited presents "Farm to Table: Making Vegan Food Delicious", featuring vegan personal chef & KPFT radio personality (and Society of PEACE member) Staci Davis. The vegan cooking class is on Sunday, March 14, 2010 from 3:00 - 7:00 PM in Sharpstown area (SW Frwy at Fondren) in Houston. Cook fresh, local cuisine grown in and around the Houston area. Discuss local farms, farmer's markets, and what grows well in Houston. Then make five delicious vegan meals from the harvest. Join members of the Houston Veggie-Lifestyle Meetup for a social Dinner. This new group will be gathering on Sunday, March 14, 2010 at Loving Hut Vegan Restaurant in Houston. This 100% vegan restaurant offers the cuisine of Asia, India and traditional American fare, as well as vegan desserts. The event begins promptly at 5:00 PM and seating is limited. Please RSVP online at the Houston Veggie-Lifestyle Meetup. The Houston Veggie-Lifestyle Meetup is organized by Alexandra. 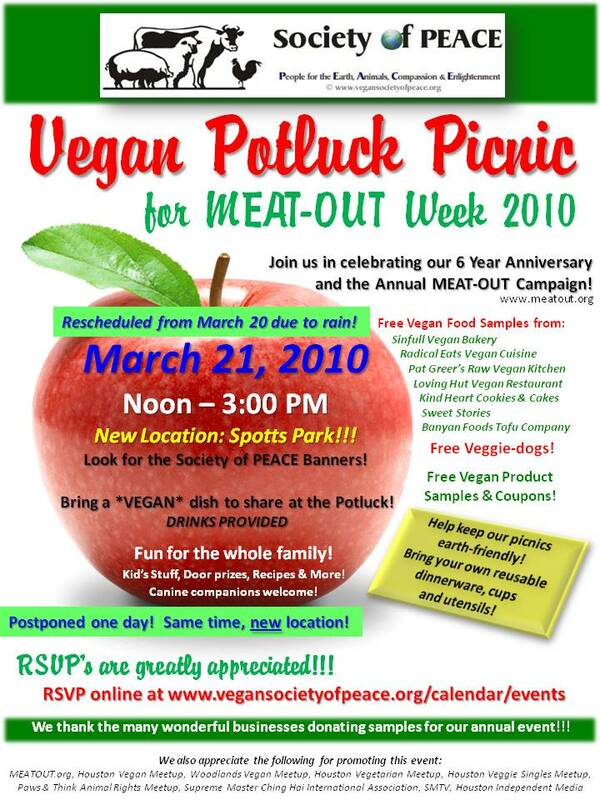 The Vegan Society of PEACE will host our Annual MEATOUT Event on Saturday, March 20, 2010 in Houston! It is also our 6th Year Anniversary Celebration! 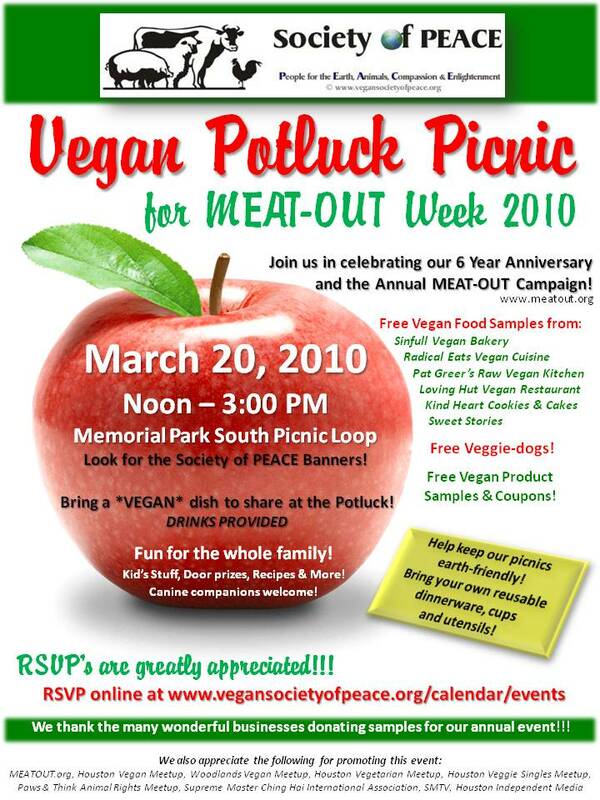 Join us for a Vegan Picnic in the Park at Memorial Park South Picnic Loop from 12:00 Noon- 3:00 PM. Enjoy free veggie dogs (while they last! ), free vegan product and food samples and plenty of free Vegetarian Starter Guides and other literature. Bring a vegan dish to share at the potluck! Help us keep our picnics earth-friendly by bringing your own re-usable picnic ware. There will be outdoor games and door prizes. This event is open to the public and all ages are welcome! Remember to bring your picnic blanket and a vegan dish to share with others! Dogs are also welcome at the park on leashes. Look for the Society of PEACE banners in the South Picnic Loop area. If you are a vegan vendor and wish to donate product or food samples for this community event, please contact Society of PEACE Director of Special Events, Misty Craft. The Animal Law Society of South Texas College of Law and the Houston Bar Association Animal Law Section jointly present "Animal Experimentation: The Current State of Affairs". This event will feature Dr. John J. Pippin, MD, senior medical & research advisor for the Physicians Committee for Responsible Medicine (PCRM), who will discuss the ethical reasons to ban animal experimentatin and the many animal-free alternatives that exist. The public is welcome to attend this educational event. The event begins promptly at 11:45 AM at the South Texas College of Law on San Jacinto, Room 314. Bring your own vegan lunch to the event. For more information on the event, please contact Christina Fojas via email. Christina is a Society of PEACE member and a representative of the Animal Law Society. The event begins promptly at 6:30 PM at the Taft Street Coffee House in Houston. The Raw Vegan Enthusiasts group meets twice monthly - on the 2nd Wednesday & 4th Thursday of every month. For more information on their group, call the Taft Street Coffee House at 712-522-3533. The Houston Humane Society is holding their 29th Annual "K-9 Fun Run" Fundraiser on Sunday, March 28. The goal is to raise funds for homeless animals. The event will take place at Sam Houston Park at 10:00 AM. Please call 713-433-6421 or visit the Houston Humane Society website for registration and additional information. You may also email info@houstonhumane.org for details. The Vegetarian Society of the Bay Area is holding their monthly meeting & potluck Luncheon on Sunday, February 28th. The event will begin at 12:30 pm and will feature a vegan potluck luncheon and door prizes. There will also be a short film screening on a related topic, as well as a book review. This group meets once a month at the Unity Church of the Bay Area in League City and the public is welcome to attend. Please remember to bring a vegan dish to share at the potluck! For more information, contact Society of PEACE Tabling & Outreach Coordinator Sandy McAvin via email, or call 281-332-8154. You can also visit the Vegetarian Society of the Bay Area website for more information. Raw Vegan Class: "Latin American Fiesta"
The Houston Vegan Raw Foods Lifestyle Meetup presents "Latin American Fiesta", featuring certified raw chef Allie K. The raw vegan class is on Sunday, March 28, 2010 from 1:45 - 5:00 PM in the Spring Branch area of Houston. Once you learn the raw vegan food preparation techniques in this class, you'll be able to make a truly healthy, as well as delicious, Latin American Fiesta for yourself and your friends. Learn how to make: Red Pepper Chips, chunky and flavorful Salsa, Authentic creamy Guacamole, hearty and satisfying Enchiladas de Verdura con Chili Colorado, a savory Mexican Seasoned Cabbage, and a Tropical Fruit Tart. The cost of the class is $65 (for early registration before March 6) and includes the meal. For more information and to register, visit the Houston Vegan Raw Foods Lifestyle Meetup. Participants must register in advance through Chef Allie K, as class size is limited!